a few more hours there before Marie-Annick arrives. In France, there are some regional dishes that possess a certain inviolable sanctity, and with some time here, you begin to realize which ones they are. Cassoulet is one of those dishes. You can tell by the way people argue about it. In practice, while the whole world gets away with plays on words and ideas when they prepare a Parmentier, sometimes omitting the potato altogether, or a Tatin, using everything from endives to foie gras and still calling it a Tatin, or a mille-feuille, where anything stacked is fair game, people don't mess with the Cassoulet. They may be inspired by it, but then they change the name. I went back to read Paula Wolfert's wonderful story of how she came to uncover the many nuances of this dish the Cassoulet, on a delicious treasure hunt through Southwest France. She is driven on an oddysey through the region that has her talking to chefs and home cooks, tasting all along the way. In her book The Cooking of Southwest France, as a preface to a few different recipes, she animatedly recounts the vehement opinions and taboos, still reminding us that the ones who insisted so strongly can also change their minds over time if effectively convinced. This, in my opinion, is the beauty in France's resilience in their quest for the truth on many matters, and what makes arguing so fun here. Paula's way of getting to the crux of the matter at best and the elements that she reveals from that search is hands down one of my favorite stories, and I can read it again and again. I was happy to see that there is a recipe using fresh beans in Paula's book, and like I often do, I read it carefully, keeping in mind the mention of duck gizzards in her story, something I had just picked up from my volailler. The great thing about Paula's recipes is that I can visualize each step. 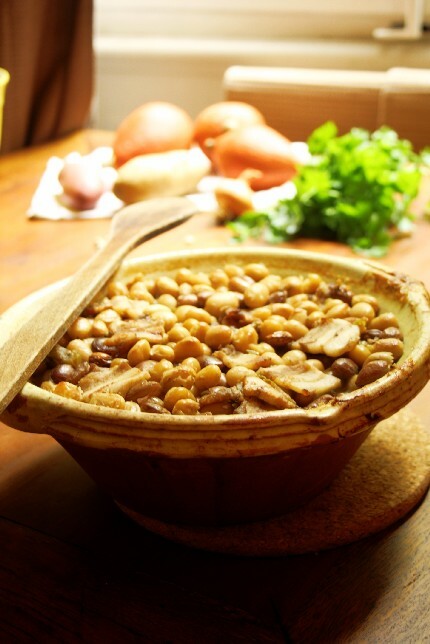 The recipe for André Daguin's fava bean Cassoulet is fresh in my mind. Kate and I have just got off the phone. She grew her own beans, of course. She told me about how this is a dish that began as one of those where the women of the town would bring it from home to the baker's oven and leave it to cook there. She surmized that the crust itself, that thing that is broken however many times during the process of cooking, is actually the process ot taking the back of a spoon and pushing the beans at the top back down into the liquid to ensure that they stay moist. Since Loic's aunt is coming, I want to make good use of these beans, and gesture in the direction of a Cassoulet. I won't even pretend to come close, my friends. With Paula and her beautiful story and recipe as inspiration and Kate's reassuring voice over the line as a guide, last night I put my beans in to bake, and have pulled them out again, having been convinced by Kate that I must bake it much longer, to build up the crust, it just tastes so much better that way. to be served to Loic’s Aunt Marie-Annick tonight, and to Christen the Cassole from Kate. - Take a tablespoon of the duck from from your gizzards confit, and heat it in a pan. - Remove the remaining fat in your way (what I do is remove what I can and reserve that in my duck fat jar for another use, and then I run them under warm water to remove the rest of the fat, then let them dry in the colander). Return to a cool place to wait for the next step. - Sauté the onion, shallots, and garlic in the duck fat until transparent. - Add the fresh pork belly, and sauté for another 5 minutes. - Add the mushroom fumet, the beans, the celery and the bouquet, and simmer for 30 minutes, adding water if necessary. - Heat the oven to 300/160. - Remove the skin form the couenne and spread the contents of the sausage onto the bottom of your cassole. - Arrange the gizzards over the couenne. - Remove the bouquet from the beans and transfer the beans and pork belly to the cassole over the gizzards with a skimmer or slotted spoon, saving the liqueur. - Pour the liqueur from the beans over the gizzards and beans to cover. - Cover the cassole with foil and bake, for one hour, ensuring that there is enough liquid to cover the beans from time to time. - Remove from heat and let cool to room temperature. Refrigerate over night. - The next day, return it to the oven for several hours, pusing the hardened beans at the top down into the juice with a spoon. Top off the juice if it reduces too much. That was quick work, Lucy. The bean ragout looks wonderful. Your cassole is beautiful too. Aunt Marie-Annick must feel a most welcome guest. Hi Lucy, I must tell you how much I enjoy your site. I love the country of France, but have only visited a couple of times. Thank you for bringing me back there! Nice. Very nice, LV. I love you using the mushroom stock, couenne sausages and of course, the gesiers! When I cooked in Italy this summer, famed Tuscan butcher Dario handed me 4 of his fat sausages filled with couenne or pork rind and fat. I grilled them, left them intact, but their savoury goodness seeped out into the cassoulet. mmmmmm. Can't wait to hear how this tastes. cassoulet. I had to chuckle over that one. I saw fresh beans in the market today - at least now I know what they are. I didn't buy them - we are hardly able to keep up with the vegetables from the garden... but, I may let the last of my green beans 'ripen' fully. I'll have to check th books for info. Your ragout sounds soooo good! The recipe above says to top off the juice if necessary but it wasn't necessary! Hi Lucy, I just wanted to comment to say how much I love your blog, the stories, and the recipes. It's the taste of France I need!